April 06, 2017 by Veronica H.
They grey linen on the sofa is lovely. Very comfortable cushions and back pillows as well. June 18, 2016 by Martina G.
Looks great in my front foyer as a bench. 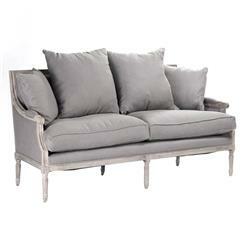 Stately with gorgeous, delicate features – this limed grey oak sofa harkens back to a luxurious, stylish time. The French country St. Germain sofa is upholstered in soft, cushiony linen with four extra pillows that allow you to style it precisely to your level of comfort. Loosen your corset and recline after a long day of croquet on the great lawn (or your belt, after a long day of chasing the kids in the yard).